To reserve your place on any of the workshops, please, call the shop or telephone 01449 741 530 or email us at info@oliven.co.uk . Full payment within 10 days of booking to secure your place in the workshop needed. A requirement list will be given at the time of booking. 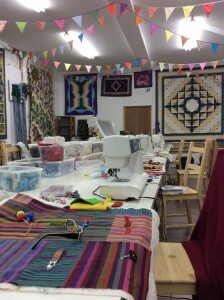 The cost of supplies and fabrics are not included in the cost of the workshop unless stated. If you purchase your supplies for the workshop at OliVen you will receive 5% discount. An informal sewing day with like-minded people, sharing ideas, helping each other and having a good time – that’s what our sewing club Scissor Sister is all about! Whether you want to start a new project or need to finish one started a long time ago, whether it’s a piece of clothing, cushion, bag or a quilt, whatever the project, no matter how big or small, let’s finish it together! Sometimes just being around other sewers is an inspiration to get the job done, so if you need a reason to try something new, or incentive to finish off an old UFO, sign up and see how quickly those projects will be completed. The club is run fortnightly on Wednesdays and Thursdays and monthly on Saturdays. For exact dates check the workshop list. You can book on regular basis or just pick the dates which suit you. Vendulka is available all day for advice. Once a month Vendulka offers her workshop and scrap fabrics up to sewers to come and spend a day making items for charity. Since its inception in March 2016, a group of ladies have been meeting up and enjoying a day of sewing, chat and creativity whilst having the added pleasure of doing something which is charitable. Throughout 2016 the group made up to nearly 80 tactile twiddle quilts for local care homes and dementia groups. These were so well-received and the sewers themselves had had such a good time that this group activity has been extended to 2017. In the second year we the projects included heart-shaped cushions for breast cancer patients – we made total of 100 cushions, sanitary pads for girls unable to source them in Africa (so they don’t need to drop out of school when their period starts) – final count 60 and pillowcase dresses for children in Africa – altogether 115. Our ladies have been very busy! In our third year of charity sewing, we are going to concentrate on quilts for children as part of Project Linus which supplies quilts for children in hospitals from birth to 18 years old. We will be making them using the quilt-as-you-go technique, simple and fast method which uses leftovers of fabric. All you need is to know how to sew a straight stitch! This is a very informal class, which is free to attend, all you need to bring is your own sewing machine, all other materials are free, but booking is advisable as spaces are limited. We welcome everybody no matter your sewing experience! Or you can help us by donating cotton fabrics or wadding leftovers. Cancellation with 2 weeks notice – we will refund your payment or offer you a place on a future workshop. Cancellations within 13 – 8 days of the workshop – we will refund 50% of the payment. Last minute cancellations, ie. 7 days or less before a workshop – we’re afraid we cannot refund any payments as from experience we’ve found it impossible to fill places at such short notice. Full refund for cancellation under 14 days possible if we replace you. Thank you for understanding with these formalities.